The Victoria Police Blue Ribbon Foundation perpetuates the memory of members of Victoria Police who have been killed in the line of duty. 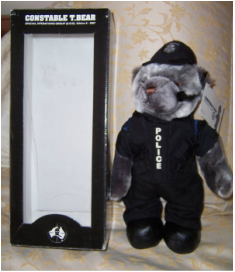 The Foundation has released a different Constable T Bear Police teddy bear each year since 2000, and they have become highly collectible and sought after. 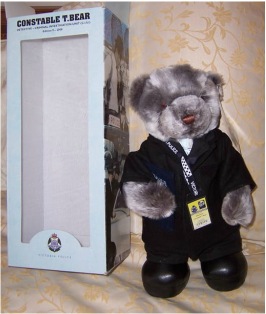 The 8th Edition of Constable T Bear depicts him as an elite member of the Victoria Police Special Operations Group and in so doing pays tribute to all past and present members of the S.O.G for their specialised commitment and contributions to law and order in Victoria. 8th Edition of Constable T Bear is a limited edition. He carrys a numbered tag to verify his authenticity. He comes in his original box which shows a little wear - see photos. He would be a wonderful gift for that special person. The 9th Edition of Constable T Bear depicts him as a Detective of the Victoria Police, Criminal Investigation Unit, and pays tribute to all past and present detective and staff for their commitment to solving crimes and making Victoria a safer place in which to live. 9th Edition of Constable T Bear is a limited edition. He carrys a numbered tag to verify his authenticity. He comes in his original box which is in great condition - see photos. The 7th Edition of Constable T Bear depicts him as a police member of the Traffic Management Unit (TMU) and is in honour of the traffic police and the valuable contribution they have made to provide safety on our roads and highways. 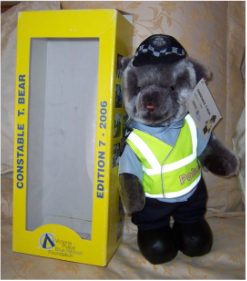 7th Edition of Constable T Bear is a limited edition. He carries a numbered tag to verify his authenticity.